Back in the spring, the Obama campaign essentially telegraphed its re-election strategy: First it would soften up Mitt Romney as the sort of heartless over-dog who could watch Seabiscuit and somehow root for his big scary rival. Then it would add a policy dimension to the argument, accusing Romney of wanting to cut taxes for the rich while defunding the programs the rest of us rely on. The personal argument would explain why Romney wanted to screw the middle class (because he’s an economic overlord who looks down on them with disdain). The policy argument would explain the how. What’s surprising isn’t that this strategy worked in the end, with Obama eking out a narrow popular vote win (even as he routed Romney in the Electoral College). The Obama folks had clearly scouted out their opponent and sized him up well. What’s surprising is that, having watched Chicago telegraph its plan, the Romney campaign chose not to adjust its own strategy in response. As I noted yesterday, there were any number of policies Romney could have adopted to defuse his ruthless rich-guy image. He could have come out for raising the miniscule tax on capital gains, which nets him millions of dollars each year. He could have proposed scaling back the tax subsidies that make it so profitable for buyout firms like Bain to take over struggling companies. With Obama likely to win Florida, Ohio, and Virginia by a combined total of under five percentage points, Romney didn’t need to reinvent himself in order to tilt the race his way. He just had to take the edge of a bit, albeit in credible fashion. 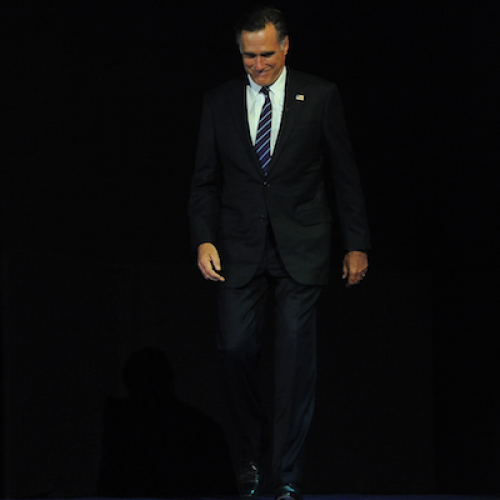 Instead—improbably—Romney ran in the opposite direction. Having allowed the Obama campaign to define him in unflattering personal terms, he didn’t even wait for their policy follow-up. He made the policy argument for them. Emphatically. Romney’s tax plan would have frozen the absurdly low capital gains rate in place, then cut income taxes another 20 percent, leaving him with no way to make up the red ink other than raising the tax burden on the middle class. Then, more brazenly, he filled the number two spot on his ticket with Paul Ryan, the author of a proposal to scale the budget for everything from science research to food stamps back to Eisenhower-era levels, while eviscerating Medicaid and dismantling Medicare. The exit polls from last night are pretty much teeming with evidence that this was disastrous for Romney—that he essentially did the Obama campaign’s work for it. For example, Obama roughly equaled his 2008 margins among voters without a college degree in both Ohio and Florida even though he won those states last night by less than half his 2008 margin. The percentage of voters in the two states who said “caring about people” was the most important quality in a president rose dramatically from 2008, and Obama won these voters by a considerably larger margin this time around. Perhaps the most damning data point was the percentage of voters who believed each candidate’s polices favored the rich. For Obama, only 10 percent of voters nationally concluded he was out to coddle the high-net-worth set, versus 44 percent who believed he wanted to work for average-income earners. For Romney, by contrast, more than half of voters said he was intent on easing the lot of the rich, against roughly a third who thought his heart was with the middle class. You simply don’t get elected president when you inspire that kind of suspicion, whatever the unemployment rate. In the end, the Romney campaign clearly misread the landscape. They believed that frustration with the economy would suffice to dislodge the president—that the race would ultimately be about the incumbent and not the challenger. And they weren’t crazy to think so. Some 75 percent of voters rated the economy as either “not good” or “poor.” In Ohio and Florida, voters had more confidence in Romney’s ability to fix it. What Romneyland missed was that the race was never entirely a referendum on the struggling economy (which, as it happened, far more people still blame on George W. Bush rather than Obama). It was also a referendum on fairness—how else to explain that 60 percent of voters nationally believe the rich should pay more taxes? In that sort of environment, Romney was never going to be an ideal candidate. But the refusal to make the slightest accommodation to Americans’ growing sense of grievance will go down as a historical blunder.